The Helblinghaus in Innsbruck, Austria. Highly decorative walls and ceiling in an oval chamber, looking up toward an ornate chandelier. Rococo describes a type of art and architecture that began in France in the mid-1700s. It is characterized by delicate but substantial ornamentation. Often classified simply as "Late Baroque," Rococo decorative arts flourished for a short period before Neoclassicism swept the Western world. Rococo is a period rather than a specific style. Often this 18th-century era is called "the Rococo," a time period roughly beginning with the 1715 death of France's Sun King, Louis XIV, until the French Revolution in 1789. It was France's Pre-Revolutionary time of growing secularism and continued growth of what became known as the bourgeoisie or middle class. Patrons of the arts were not exclusively royalty and aristocrats, so artists and craftsmen were able to market to a wider audience of middle-class consumers. Wolfgang Amadeus Mozart (1756-1791) composed not only for Austrian royalty but also for the public. The Rococo period in France was transitional. The citizenry was not beholden to the new King Louis XV, who was only five-years-old. The period between 1715 and when Louis XV came of age in 1723 is also known as the Régence, a time when the French government was run by a "regent," who moved the center of government back to Paris from the opulent Versailles. Ideals of democracy fueled this Age of Reason (also known as the Enlightenment) when society was becoming liberated from its absolute monarchy. Scale was downsized—paintings were sized for salons and art dealers instead of palace galleries—and elegance was measured in small, practical objects like chandeliers and soup tureens. Characteristics of Rococo include the use of elaborate curves and scrolls, ornaments shaped like shells and plants, and entire rooms being oval in shape. Patterns were intricate and details delicate. Compare the intricacies of the c. 1740 oval chamber shown above at France's Hôtel de Soubise in Paris with the autocratic gold in the chamber of France's King Louis XIV at the Palace of Versailles, c. 1701. In Rococo, shapes were complex and not symmetrical. Colors were often light and pastel, but not without a bold splash of brightness and light. The application of gold was purposeful. "Where the baroque was ponderous, massive, and overwhelming," writes fine arts professor William Fleming, "the ​Rococo is delicate, light, and charming." Not everyone was charmed by Rococo, but these architects and artists did take risks that others previously had not. Painters of the Rococo era were free not only to create great murals for grand palaces but also smaller, more delicate works that could be displayed in French salons. Paintings are characterized by the use of soft colors and fuzzy outlines, curved lines, detailed ornamentation, and a lack of symmetry. The subject matter of paintings from this period grew bolder—some of it may even be considered pornographic by today's standards. Silver Candlesticks from Italy, 1761. During the 1700s, a highly ornamental style of art, furniture, and interior design became popular in France. Called Rococo, the lavish style combined the delicacy of French rocaille with Italian barocco, or Baroque, details. Clocks, picture frames, mirrors, mantel pieces, and candlesticks were some of the useful objects beautified to become known collectively as "decorative arts." In French, the word rocaille refers to rocks, shells, and the shell-shaped ornaments used on fountains and the decorative arts of the time. Italian porcelain candlesticks decorated with fish, shells, leaves, and flowers were common designs from the 18th century. Generations grew up in France believing in Absolutism, that the King was empowered by God. Upon the death of King Louis XIV, the notion of the "divine right of kings" came under question and a new secularism was unveiled. The manifestation of the Biblical cherub became the mischievous, sometimes naughty putti in paintings and the decorative arts of the Rococo time. If any of these candlesticks look slightly familiar, it could be that many of the Walt Disney characters in Beauty and the Beast are Rococo-like. Disney's candlestick character Lumiere in particular looks like the work of French goldsmith Juste-Aurèle Meissonnier (1695-1750), whose iconic candélabre, c. 1735 was often imitated. It's not surprising to discover that the fairy tale La Belle et la Bête was retold in a 1740 French publication—the era of the Rococo. The Walt Disney style was right on the button. Les Plaisirs du Bal or Pleasures of the Ball (Detail) by Jean Antoine Watteau, c. 1717. The three best-known Rococo painters are Jean Antoine Watteau, François Boucher, and Jean-Honore Fragonard. The 1717 painting detail shown here, Les Plaisirs du Bal or The Pleasure of the Dance by Jean Antoine Watteau (1684-1721), is typical of the early Rococo period, an era of changes and contrasts. The setting is both inside and outside, within grand architecture and opened to the natural world. People are divided, perhaps by class, and grouped in such a way that they may never unite. Some faces are distinct and some are blurred; some have their backs turned toward the viewer, while others are engaged. Some wear bright clothing and others appear darkened as if they were escapees from a 17th century Rembrandt painting. Watteau's landscape is of the time, anticipating the time to come. François Boucher (1703-1770) is known today as the painter of boldly sensuous goddesses and mistresses, including the goddess Diane in various poses, the reclining, half-naked Mistress Brune, and the reclining, naked Mistress Blonde. The same "mistress pose" is used for a painting of Louise O'Murphy, close friend to King Louis XV. Boucher's name is sometimes synonymous with Rococo artistry as is the name of his famous patron, Madame de Pompadour, the King's favorite mistress. Jean-Honore Fragonard (1732-1806), a student of Boucher, is well-known for creating the quintessential Rococo painting—The Swing c. 1767. Frequently imitated to this day, L'Escarpolette is at once frivolous, naughty, playful, ornate, sensual, and allegoric. The lady on the swing is thought to be yet another mistress of another patron of the arts. Marquetry Detail by Chippendale, 1773. As hand tools became more refined in the 18th century, so, too, were the processes developed using those tools. Marquetry is an elaborate process of inlaying wood and ivory designs onto a piece of veneer to be attached to furniture. The effect is similar to parquetry, a way to create designs in wood flooring. Shown here is a marquetry detail from the Minerva and Diana commode by Thomas Chippendale, 1773, considered by some to be the English cabinet-maker's finest work. French furniture made between 1715 and 1723, before Louis XV came of age, is generally called French Régence—not to be confused with the English Regency, which occurred about a century later. In Britain, Queen Anne and late William and Mary styles were popular during the French Régence. In France, the Empire style corresponds to English Regency. Louis XV furniture could be filled with marquetry, like Louis XV style oak dressing table, or ornately carved and gilded with gold, like Louis XV carved wooden table with marble top, 18th century, France. In Britain, upholstery was lively and bold, such as English decorative art, walnut settee with Soho tapestry, c. 1730. Catherine Palace Near St. Petersburg, Russia. 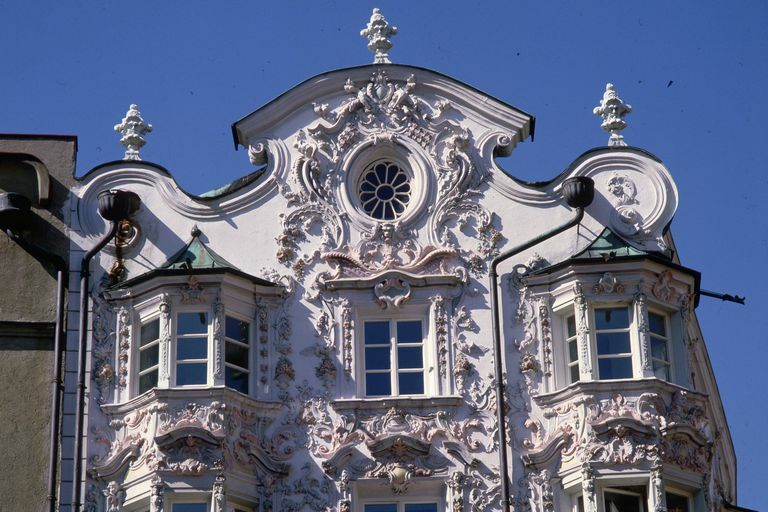 While elaborate Baroque architecture is found in France, Italy, England, Spain, and South America, the softer Rococo styles found a home throughout Germany, Austria, Eastern Europe, and Russia. Although Rococo was largely confined to interior decor and decorative arts in Western Europe, Eastern Europe was infatuated by Rococo stylings both inside and outside. Compared with the Baroque, Rococo architecture tends to be softer and more graceful. Colors are pale and curving shapes dominate. Catherine I, Empress of Russia from 1725 until her death in 1727, was one of the great women rulers of the 18th century. The palace named for her near St. Petersburg was begun in 1717 by her husband, Peter the Great. By 1756 it was expanded in size and glory specifically to rival the Versailles in France. It is said that Catherine the Great, Empress of Russia from 1762 until 1796, highly disapproved of the Rococo extravagance. Marble Hall in Upper Belvedere Palace, Vienna, Austria. Belvedere Palace in Vienna, Austria was designed by architect Johann Lukas von Hildebrandt (1668-1745). The Lower Belvedere was built between 1714 and 1716 and the Upper Belvedere was built between 1721 and 1723—two massive Baroque summer palaces with Rococo era decorations. Marble Hall is in the upper palace. The Italian Rococo artist Carlo Carlone was commissioned for the ceiling frescoes. Inside Wieskirche, the Bavarian Church by Dominikus Zimmermann. Exuberant Rococo style interiors can be surprising. The austere exterior architecture of Dominikus Zimmermann's German churches doesn't even hint at what is inside. The 18th-century Bavarian Pilgrimage Churches by this stucco master are studies in two faces of architecture—or is it Art? Dominikus Zimmermann was born June 30, ​1685 in the Wessobrunn area of Bavaria, Germany. Wessobrunn Abbey was where young men went to learn the ancient craft of working with stucco, and Zimmerman was no exception, becoming part of what became known as the Wessobrunner School. By the 1500s, the region had become a destination for Christian believers in healing miracles, and local religious leaders encouraged and perpetuated the draw of outside pilgrims. Zimmermann was enlisted to build gathering places for miracles, but his reputation rests on only two churches built for the pilgrims—Wieskirche in Wies and Steinhausen in Baden-Wurttemberg. Both churches have simple, white exteriors with colorful roofs—enticing and non-threatening to the common pilgrim seeking a healing miracle—yet both interiors are landmarks of Bavarian Rococo decorative stucco. Rococo architecture flourished in southern German towns in the 1700s, originating from the French and Italian Baroque designs of the day. The craft of using the ancient building material, stucco, to smooth uneven walls was prevalent and easily transformed into an imitation marble called scagliola (skal-YO-la)—a material cheaper and easier to work with than creating pillars and columns from stone. The local competition for stucco artists was to use the pasty plaster to transform craft into decorative art. One questions whether the German stucco masters were builders of churches for God, servants of Christian pilgrims, or promoters of their own artistry. "Illusion, in fact, is what the Bavarian rococo is all about, and it applies everywhere," claims historian Olivier Bernier in The New York Times, "Although the Bavarians were, and remain, devoted Catholics, it is hard not to feel that there is something deliciously nonreligious about their 18th-century churches: more like a cross between salon and theater, they are full of amiable drama." Zimmerman's first success, and perhaps the first Rococo church in the region, was the village church in Steinhausen, completed in 1733. The architect enlisted his older brother, the fresco master Johann Baptist, to meticulously paint the interior of this pilgrimage church. If Steinhausen was the first, the 1754 Pilgrimage Church of Wies, shown here, is considered the high point of German Rococo decoration, complete with an allegorical Door of Heaven in the ceiling. This rural Church in the Meadow was again the work of the Zimmerman brothers. Dominikus Zimmerman used his stucco- and marble-working artistry to build the lavish, ornate sanctuary within the somewhat simple, oval architecture, as he had first done in Steinhausen. Gesamtkunstwerke is the German word that explains Zimmerman's process. Meaning "total works of art," it describes the architect's responsibility for both the exterior and interior design of their structures—the construction and decoration. More modern architects, such as the American Frank Lloyd Wright, have also embraced this concept of architectural control, inside and out. The 18th century was a transitional time and, perhaps, the beginning of the modern world we live in today. Rococo Style Architecture on the National Ceramics Museum in Valencia, Spain. In Spain and her colonies the elaborate stucco work became known as churrigueresque after the Spanish architect José Benito de Churriguera (1665-1725). The influence of French Rococo can be seen here in the sculpted alabaster by Ignacio Vergara Gimeno after a design by architect Hipolito Rovira. In Spain, elaborate details were added throughout the years to both ecclesiastical architecture like Santiago de Compostela and secular residences, like this Gothic home of the Marquis de Dos Aguas. The 1740 renovation happened during the rise of Rococo in Western architecture, which is a treat for the visitor to what is now the National Ceramics Museum. Time Unveiling Truth (Detail), 1733, by Jean-François de Troy. Paintings with allegorical subject matter were common by artists who were not bound to aristocratic rule. Artists felt free to express ideas that would be seen by all classes. The painting shown here, Time Unveiling Truth in 1733 by Jean-François de Troy, is such a scene. The original painting hanging in London's National Gallery personifies the four virtues on the left—fortitude, justice, temperance, and prudence. Unseen in this detail is the image of a dog, the symbol of faithfulness, sitting at the feet of the virtues. Along comes Father Time, who reveals his daughter, Truth, who in turn pulls the mask from the woman on the right—perhaps the symbol of Fraud, but certainly a being on the opposite side of the virtues. With Rome's Pantheon in the background, a new day is unmasked. Prophetically, Neoclassicism based on the architecture of ancient Greece and Rome, like the Pantheon, would dominate the next century. Madame de Pompadour, the mistress muse of King Louis XV, died in 1764, and the king himself died in 1774 after decades of war, aristocratic opulence, and the blooming of the French Third Estate. The next in line, Louis XVI, would be the last of the House of Bourbon to rule France. The French people abolished the monarchy in 1792, and both King Louis XVI and his wife, Marie Antoinette, were beheaded. The Rococo period in Europe is also a period when America's Founding Fathers were born—George Washington, Thomas Jefferson, John Adams. The Age of Enlightenment culminated in revolution—both in France and in the new America—when reason and scientific order dominated. "Liberty, equality, and fraternity"​ was the slogan of the French Revolution, and the Rococo of excess, frivolity, and monarchies was over. Professor Talbot Hamlin, FAIA, of Columbia University, has written that the 18th century was transformational in the way we live—that the homes of the 17th century are museums today, but dwellings of the 18th century are still functional residences, practically built to a human scale and designed for convenience. "The Reason which had begun to occupy such an important place in the philosophy of the time," Hamlin writes, "has become the guiding light of architecture." Are You Stuck on Stucco, the Multi-Use Building Material?